Shameka Carter stood in front of a grocery store offering hugs to all comers. HOUSTON, Texas – A week after Hurricane Harvey exacted its wrath, Shameka Carter decided Houston needed a hug. So, this weekend, she gave it one. Both Friday and Saturday Carter stood near the entrance of the Summerwood H-E-B grocery store, palms up, arms extended, as Texan after Texan retreated into the comfort of her warm embrace. Carter pitched her free hugs on a handwritten sign propped nearby. 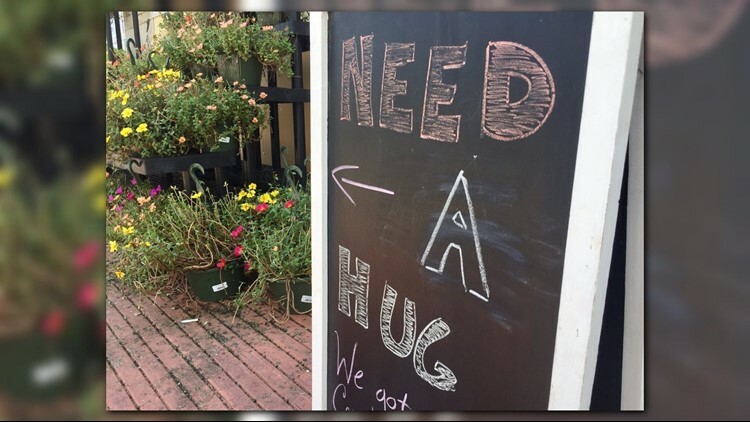 A store manager added a second “free hugs” message on a small chalk board, reasoning that a hug might do some of his customers some good. Amador Zepeda still reeling from his Harvey losses slammed his pickup into park, its motor still running, and strode toward Carter like a man on a mission. Carter explained her purpose to anyone who asked, but most recipients of her hugs seemed satisfied with Carter’s “God Bless you” as they smiled and returned to their shopping trip. “It just fills my heart to see people just giving love to each other,” said Sara Pereeo, who accepted Carter’s hug and then lingered to watch others do the same. The single mother of three, who works as school physical education aide, was inspired to act earlier in the week after a stranger picked up the tab for her groceries. Carter had just returned from the store ATM after finding herself with an empty wallet and was told by a cashier that her bill had been covered by another shopper. The temperature hovered near 90 as Carter stood for two hours at the edge of the hot asphalt parking lot embracing shopper after shopper. A middle-aged man paused to read Carter’s sign, then raised his own arms to accept her hug. “I think we all need one right now,” he told her.